With a complimentary buffet breakfast Wi-Fi outdoor pool sauna fitness room and on-site restaurant the pet-friendly Best Western Plus Brookside Inn has the value-added amenities along with a freeway-convenient location that get our guests' attention. Mornings at the two-floor Best Western Plus start off with a complimentary hot breakfast buffet including Starbucks coffee eggs sausage waffles bagels and more. An on-site full-service restaurant serves Indian cuisine. Relax after a long day of work in the heated outdoor pool or work up a sweat in the sauna or 24-hour gym. Most of the hotel's 78 rooms are non-smoking and have pillowtop mattresses free Wi-Fi and local calls microwave and mini-fridge work desk flat-panel cable TV with HBO ESPN and other premium channels. Some rooms have private balconies. Pets are welcome (for a fee). Other amenities include a guest laundry facility fax and copy services and free parking. 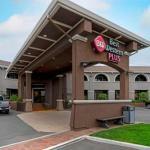 Right off I-880 in a shopping area with lots of casual dining options the Best Western Plus is eight minutes from the Great Mall of the Bay Area. Mineta San Jose International Airport is six miles. Dogs are welcome are this hotel. Pet Amenities Available Click through for more information or to book.